Spain: Day 27 of 985 of the Spanish Civil War. Spain: Day 392 of 985 of the Spanish Civil War. CBI - China: Day 37 of 2,987 of the 2nd Sino-Japanese War. Day 12 of 12 of the Battle of Chahar. The battle ends with a Japanese victory. Germany: Germany mobilizes their military, calling up military reserves and begin military maneuvers. Spain: Day 757 of 985 of the Spanish Civil War. CBI - China: Day 402 of 2,987 of the 2nd Sino-Japanese War. Day 63 of 139 of the Battle of Wuhan. CBI - China: Day 767 of 2,987 of the 2nd Sino-Japanese War. Day 60 of 68 of the Battle of Tianjin. CBI - Mongolia: Day 94 of 129 of the Battle of Khalkhin Gol, a border dispute between the Soviet Union and Japan. UK: It officially becomes illegal to any waste food in the United Kingdom. Atlantic: Italian sub MALASPINA sinks the British tanker BRITISH FAME near the Azores. ETO - UK: Day 34 of 114 of the Battle of Britain. The Luftwaffe attacks Portsmouth, Isle of Wight and radar stations all along the coast. East Africa: Day 64 of 537 of Italy's East African campaign in the lands south of Egypt. In British Somaliland, Italian troops renew their attack at Tug Argan, capturing a hill defended by the Northern Rhodesian Regiment. CBI - China: Day 1,133 of 2,987 of the 2nd Sino-Japanese War. Day 272 of 381 of the Battle of South Guangxi. USA: By just a single vote, Congress passes a modification to the Selective Service Act, extending the service period of draftees as requested by Roosevelt. Canada: Churchill and Roosevelt sign the Atlantic Charter, an eight-point declaration of peace aims. Atlantic: The HMS PICOTEE is sunk by the German sub U-568 in the North Atlantic. ETO - Germany: Before dawn, the RAF bombs the railway yards at Hanover. After sundown, the RAF hits the power plants near Köln. USSR: The Central Committee of the Soviet Communist Party orders their security forces to deport the entire population of the Volga German Autonomous Republic to destinations in Central Asia and Siberia. Russian Front - Finland: Day 45 of 142 of Operation SILVER FOX, a joint German-Finnish campaign to capture the Russian port of Murmansk in the Arctic. Russian Front - Finland: Day 43 of 140 of Operation ARCTIC FOX, a joint German-Finnish campaign against Soviet Northern Front defenses at Salla, Finland. Russian Front - Finland: Day 52 of 164 of the Battle of Hanko. Russian Front: Day 52 of 167 of Germany's Operation BARBAROSSA, the invasion of the USSR. Russian Front - North: Army Group North continues their slow advance toward Leningrad. Soviet troops counter-attack at Staraya Russa south of Lake Ilmen. Russian Front - Center: Day 20 of 38 of the Battle of Gomel, Belarus. Heavy fighting continues at Gomel. Russian Front - Center: Hitler temporarily abandons his plans to capture Moscow so he can put more troops down south. Russian Front - South: Day 5 of 70 of the Siege of Odessa, Ukraine. MTO - Libya: Day 125 of 256 of the Siege of Tobruk. East Africa: Day 429 of 537 of Italy's East African campaign in the lands south of Egypt. CBI - China: Day 1,498 of 2,987 of the 2nd Sino-Japanese War. 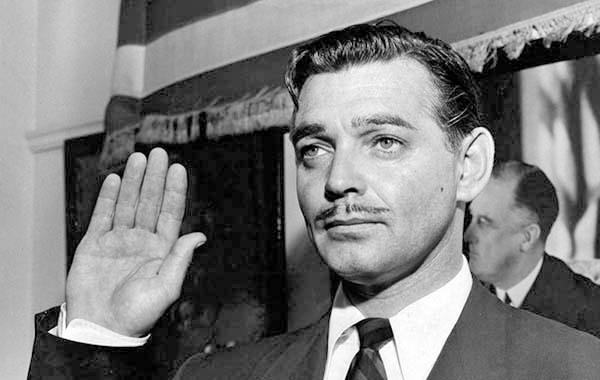 USA: Actor Clark Gable enlists in the US Army Air Force and begins training to become a gunner on a heavy bomber crew. "Frankly, Uncle Sam, I do give a damn!" Although still a thoroughly professional actor on the set, it was obvious that Clark Gable was not the same after the tragic 16 Jan 42 death of his wife, Carole Lombard. Upon America's entry in the war, she had urged him to enlist as part of the war effort, but MGM was quite reluctant to let such a valuable property go. Eventually Clark Gable did join the US Army Air Forces with full intention of being an ordinary soldier. MGM arranged for his studio friend, cinematographer Andrew McIntyre, to enlist with him and accompany him through training. Seems both the studio and the army had determined that Gable's service would not be as ordinary as he expected. ETO: The responsibility for maintaining law and order in German-occupied Belgium, Denmark, Holland, and Norway is given to Himmler and the SS organization. USSR: Stalin and Churchill meet in Moscow for the First Moscow Conference. Stalin is told that there will be no second front in 1942. Russian Front - North: Day 339 of 872 of the Siege of Leningrad. Russian Front - North: Day 100 of 658 of the Siege of the Kholm Pocket. Russian Front - Center: Day 14 of 64 of the 1st Battle of Rzhev-Sychevka, Russia. German troops near Rzhev continue their attempts to break their encirclement. Russian Front - South: Day 46 of 150 of Germany's CASE BLUE. German Army Group A captures Elista near the Caspian Sea. MTO - Malta: Heavy Axis submarine and air attacks throw an Allied convoy to Malta into confusion. During the night, a torpedo boat sinks four of the Allied merchant ships. East Africa: Day 100 of 186 of the Battle of Madagascar. CBI - China: Day 1,863 of 2,987 of the 2nd Sino-Japanese War. Day 90 of 124 of Japan's Zhejiang-Jiangxi Campaign, launched to punish anyone suspected of aiding the Doolittle raiders in China. Roughly 250,000 Chinese will be killed. The Heito POW Camp, also known as Taiwan Prisoners of War Camp No 3, is opened in southern Formosa (Taiwan). Within weeks it will be filled with captured American and Filipino troops. PTO - Alaska: Day 67 of 435 of the Battle of Kiska, Aleutian Islands. PTO - Malaya: Day 175 of 357 of the Battle of Timor Island. PTO - New Guinea: Day 23 of 119 of the Battle of the Kokoda Track. US 5th and 13th Air Forces provide air support. PTO - Solomon Islands: Day 6 of 187 of the Battle of Guadalcanal. US 5th Army Air Force provides air support. A 25-man US Marine patrol is attacked and only 3 men survive. The Japanese destroyer YUZUKI bombard the US Marines. 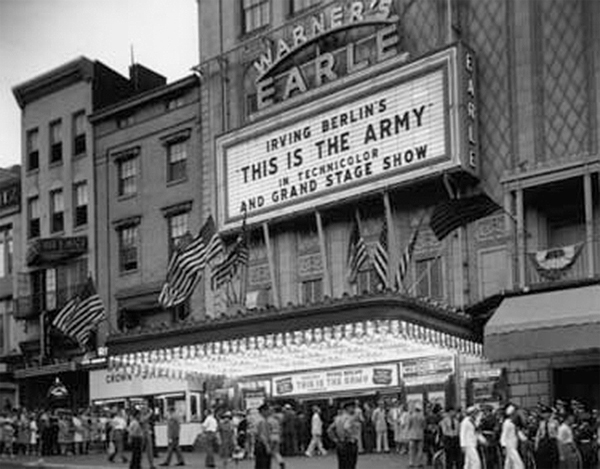 USA: Irving Berlin's wartime musical This Is the Army, designed to boost morale in the US, premieres at Warner's Earle Theater, Washington DC. The screenplay was based on the 1942 Broadway musical by Irving Berlin, who also composed the film's 19 songs and broke screen protocol by singing one of them. The movie features a large ensemble cast, including George Murphy, Joan Leslie, Alan Hale, Sr., Rosemary DeCamp, and Ronald Reagan, while both the stage play and film included soldiers of the US Army who were actors and performers in civilian life. This Is the Army grossed well over $9,500,000, which was all donated to Army Emergency Relief. The musical score was nominated and won for Scoring of a Musical Picture at the 16th Annual Academy Awards. The film was also nominated in the category Best Sound (Nathan Levinson). ETO - Germany: US 8th Air Force B-17s bomb industrial targets in the Ruhr River Valley. Russian Front - North: Day 704 of 872 of the Siege of Leningrad. Russian Front - North: Day 465 of 658 of the Siege of the Kholm Pocket. Russian Front - Center: Day 39 of 50 of the Battle of Kursk, Russia. Russian Front - Center: Day 32 of 38 of the Battle of Orel, Russia. Russian Front - Center: Day 6 of 57 of the 2nd Battle of Smolensk, Russia. Russian Front - Center: Day 6 of 14 of the Battle of Spas-Demensk, Russia. Russian Front - South: Day 21 of 23 of the Battle of Belgorod, Russia. Soviet troops continue attacking hard in the Belgorod-Bogodukhov area. Russian Front - South: Day 31 of 48 of the USSR's Lvov-Sandomierz Offensive. The outflanked Germans continue retreating. MTO - Italy: Day 35 of 40 of the Battle of Sicily. RAF and US Air Forces provide air support. The Germans continue evacuating Sicily while the US 7th Army gains a favorable position to assault Randazzo and the British 8th Army captures Maletto and Riposto. CBI - China: Day 2,228 of 2,987 of the 2nd Sino-Japanese War. PTO - Alaska: Day 432 of 435 of the Battle of Kiska, Aleutian Islands. US 11th Air Force bombs targets on Kiska Island. PTO - New Guinea: Day 113 of 148 of the 2nd Battle of Lae-Salamaua. US 5th and 13th Air Forces provide air support. PTO - Solomon Islands: Day 54 of 67 of the Battle of New Georgia. US 5th and 13th Air Forces provide air support. ETO: Operation PLUTO (Pipe-Lines Under The Ocean): The world's first undersea oil pipeline is laid between England and France 70 nautical miles from the Isle of Wight through the English Channel to the Cherbourg peninsula and is considered one of history's greatest feats of military engineering. 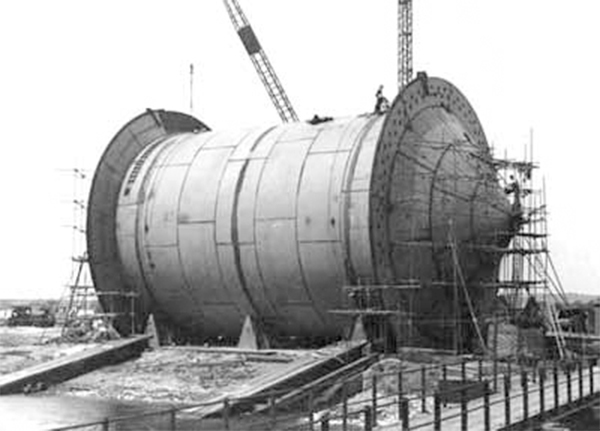 The PLUTO pipeline was wound onto enormous floating "conundrums" that were designed to spool off the pipe when towed. As the spools unwound, the pipe settled to the bottom of the English Channel. Pipelines were considered necessary to relieve dependence on oil tankers, which could be slowed by bad weather, were susceptible to German submarines, and were also needed in the Pacific War. Two types of pipeline were developed for Operation PLUTO: the flexible HAIS (Hartley-Anglo-Iranian-Siemens) pipe, a modification of existing undersea telegraph cables, and a less flexible steel pipe known as HAMEL (a contraction of the names of two chief engineers from the Iraq Petroleum Company and the Burmah Oil Company, HA Hammick and BJ Ellis). The PLUTO pipelines were linked to pump stations on the English coast, housed in various inconspicuous, uninhabited buildings including cottages and garages, intended to cloak their real purpose. Millions of gallons of gasoline, aviation and other fuels were pumped to the continent under complete secrecy. Incredibly the pipeline, and the 17 more that followed, eventually stretched all the way through France, Belgium, Holland and all the way to Berlin. The Germans never found out about them and were bewildered at how the Allies managed to be constantly well supplied with fuel. ETO - UK: Day 61 of 86 of the V-1 "Buzz Bomb" offensive on Britain. ETO - France: Day 19 of 29 of the Breakout Battle of Normandy. Allied Air Forces provide air support. ETO - France: Day 12 of 284 of the Battle of Brittany. Germany: The first transport of Polish civilians arrested during the Warsaw Uprising arrives at Auschwitz. Russian Front - Finland: The Soviet minesweeper T-118 is sunk by the German sub U-365 in the Kara Sea in the Arctic Circle. Russian Front - Finland: Day 18 of 19 of the Battle of Ilomantsi, North Karelia. Russian Front - North: Day 19 of 19 of the Battle of Tannenberg Line, Estonia. The Germans continue holding the Sinimaed Hills west of Narva. The Soviets quit their offense on the Germans holding the Sinimaed Hills west of Narva. Russian Front - North: Day 3 of 28 of the Battle of Tartu in southeastern Estonia. Russian Front - Center: Day 16 of 32 of the Battle of Kaunas, Lithuania. Russian Front - Center: Day 7 of 9 of the Battle of Osovets, Poland. CBI - Burma: Day 161 of 166 of the UK's Operation THURSDAY. US 10th Air Force provides air support. CBI - Burma: Day 134 of 302 of the Chinese Salween Offensive. US 14th Air Force provides air support. CBI - China: Day 2,594 of 2,987 of the 2nd Sino-Japanese War. Day 118 of 259 of Japan's Operation ICHI-GO. PTO - Alaska: US 11th Air Force bomb Paramushiru and Shimushu Islands. PTO - Dutch New Guinea: Day 42 of 61 of the Battle of Noemfoor. Although the island has been declared secured, bitter fighting from Japanese continues. PTO - New Guinea: Day 78 of 83 of the Battle of Biak. There are still 3,000 Japanese soldiers on the island who won't give up. PTO - New Guinea: Day 242 of 597 of the Battle of New Britain. US 13th Air Force provides air support. PTO - New Guinea: Day 113 of 481 of the Battle of Western New Guinea. 5th Air Force provides air support. PTO - New Guinea: Day 60 of 80 of the Battle of Lone Tree Hill. PTO - New Guinea: Day 34 of 47 of the Battle of Driniumor River. PTO - Philippines: The USS PUFFER attacks a Japanese convoy, sinking the tanker TEIKON MARU and a freighter. PTO - Russia: The USS POMPON sinks the Japanese transport MIKAGE MARU NUMBER 20 off Sakhalin island during the night. PTO - Solomon Islands: Day 286 of 295 of the Battle of the Bougainville Islands. US 13th Air Force provides air support. CBI - China: Day 2,959 of 2,987 of the 2nd Sino-Japanese War. Day 4 of 25 of the Soviet Invasion of Manchuria. Soviet forces in the Manchuria region of northeastern China have advanced 200 miles in four days. Meanwhile, the Soviet Pacific Fleet attacks in northern Korea, seizing the Japanese naval base at Rashin and the port of Yuki. CBI - Malaya: The USS CARBONERO sinks a junk in the Gulf of Siam. PTO - Alaska: US 11th Air Force bomb at Kataoka on Shimushu Island and the Suribachi Airfield on Paramushiru Island. PTO - Borneo: Day 64 of 67 of the Battle of North Borneo. US 5th and 13th Air Forces provide air support. PTO - Japan: The Japanese Emperor Hirohito orders his government to surrender. PTO - Japan: The final radio broadcast of "The Zero Hour" is made, a program of jazz, popular music and news, interlaced with demoralizing commentary and appeals to surrender or sabotage the Allied war effort. It had aired regularly since 31 Mar 43. PTO - New Guinea: Day 594 of 597 of the Battle of New Britain. US 10th Air Force provides air support. PTO - New Guinea: Day 478 of 481 of the Battle of Western New Guinea. US 10th Air Force provides air support. PTO - Philippines: Day 296 of 299 of the 2nd Battle of the Philippines, aka the Liberation of the Philippines or the Philippines Campaign. PTO - Philippines: Day 241 of 244 of the Battle of Luzon. The battle is said to over but hold-outs will continue fighting until the end of the war. PTO - Philippines: Day 156 of 159 of the Battle of Mindanao Island. The battle is said to over but hold-outs will continue fighting until the end of the war. The real heroes of the war were the brilliant engineers whose creative strategies, tactics, and organizational decisions made the lofty Allied objectives into a successful reality. Although more of a series of anecdotes, than a regular narrative, this book nevertheless manages to inform the reader about a side of war that no one ever seems to think about: supply and engineering.